The Greenway is nothing more than the world's most expensive median strip - and a hard lesson for the city. 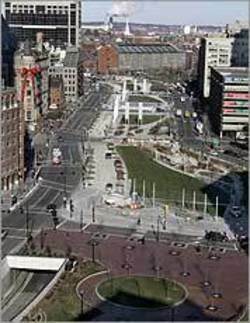 In 2004, Big Dig workers began dismantling the old elevated Central Artery, leaving a moonscape of debris and construction equipment in their wake. But fear not, officials assured us, something wondrous would soon emerge: the 15-acre Rose Fitzgerald Kennedy Greenway. Well, it's emerged, all right. Not wondrous, though, wretched - wretched not only in execution but also in conception. Poor Rose's Greenway neither cures the ills left by the Big Dig nor gives us a decent piece of open space. Odds are, you've never walked its length, and in your mind's eye the notion of a "greenway" conveys some sense of meandering parkland, a cool, green r espite from urban rigors. Far from it. The Greenway is less a park than a series of disjointed "parklettes." Officially, there are four (Chinatown, Dewey Square, the Wharf, and the North End). In reality, it's more like 15, with each of the spaces cut up by cross streets. The parklettes are filled with the various gimcracks beloved by landscape architects who try to "define" spaces, inject "whimsy," and "echo" history, but which really look more like leftovers from a giant Tonka Toy. I walk the Greenway at noon on a pleasant winter's day, and it feels as if I'm on the world's most expensive median strip. Three lanes of traffic travel on each side of me, two roaring and honking mechanistic rivers. People are out; the city is busy. Yet on my excursion, it occurs to me that I have found the answer to Southwest Airlines' "Wanna Get Away?" query. Visit the Greenway. I'm the sole pedestrian, alone in a crowded city. If Thoreau were alive and seeking solitude today, he might have chosen the Greenway over Walden Pond. I'm being unfair. Come summertime, I have little doubt that workers from nearby office buildings will venture outside to catch some noontime sun. Good for them. Still, I imagine I could put together a list of 100 things Boston might have done to improve itself, and nowhere on that list would be, "Create more outside places for office workers to lunch." But $14.8 billion later, that's what we've got. The real problem, however, is not the insipidity of the parklettes. Rather, it's the notion of the Greenway itself. I have long been skeptical that open space was the best use for these new acres. I had hoped to be wrong, but, sadly, am not. What should we have done instead? Stand in one of the North End parklettes and look east. You'll see the densely packed brick buildings of the North End. Look west and, lo and behold, you'll see the same kinds of buildings in the Haymarket. Why is that? Because the two sides used to be one. The elevated highway was built back in an era - the 1950s - when urban planners did whatever they wanted. They wanted a north-south highway and, r-i-i-p, homes were torn down and 20,000 residents were summarily displaced. ("Ah," I can hear real estate developers sighing, "Those were the days.") Many, quite accurately, described the Central Artery as a wound through the city and, carrying the metaphor further, the purpose of the Big Dig was to close that wound. Instead, we've just turned the wound into a scar. The right approach would have been to build across, filling in the emptiness with the kinds of buildings that exist on both sides and knitting the two halves together. That's true not only of the North End, but also of the other halves divided by the parklettes: Chinatown could link with the Leather District, downtown with the waterfront. Instead, we've kept in place a mile-long moat between two parts of the city. Sure, with the elevated highway down, at least one can see the other side. But the division remains. And so the Greenway fails. As a park - or series of parks - it's dull, hard to reach, and seems doomed to become a trash-strewn no man's land. Ultimately, it's an object lesson for the next time we decide to fix one of our broken spaces (City Hall Plaza leaps to mind). The Greenway lacks courage, insisting on remembering - or paying homage to? - a regretted roadway that would have been better forgotten. Originally published in The Boston Globe Magazine, January 27, 2008.